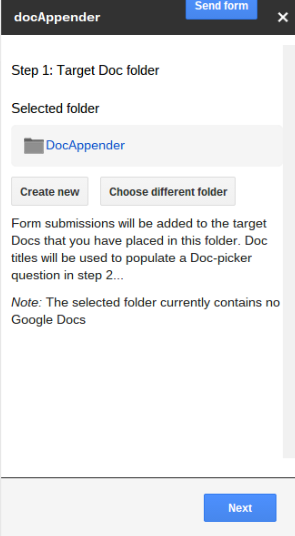 DocAppender Google Form add on will automatically place data from a google form in a Google Doc. It just takes a few simple steps. The key to DocAppender is you need a multiple choice, checkbox or choose from a list. An ideal use would be the list of students in your class. Because of privacy concerns, or my example I choose three different StarWars scenes to evaluate the acting. 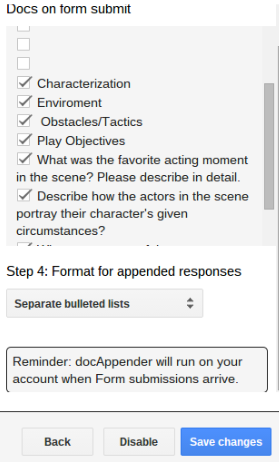 It the multiple choice, checkbox, or choose from the list that DocAppender uses to determine which Google Doc the Google Form data gets placed into. 3. Create the Google Docs in the folder you just created. Be sure to name the the same or very similar to your choices in the multiple choice question in the form. 7. 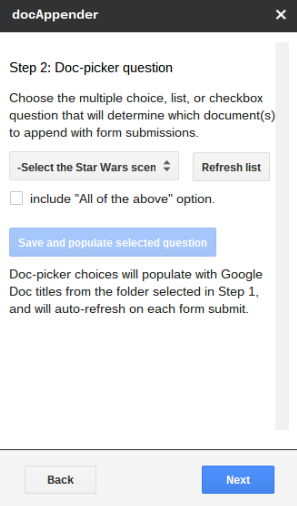 Choose Doc-Picker question- Probably your list of students, Starwars scene for my example. 8. Select what questions/data from your form to do you want placed into your Google Documents. Thanks so much to New Visions for Public Schools for all their hard work for teachers and creating these great tools tools for educators. Thank you Andrew Stillman and Jesse Spevack for the creation of these great Adds-ons. Check out New Visions Cloud Lab. *Want students let students provide anonymous feedback but still want to know made who made what comments. Make sure you check the two boxes while creating your form. 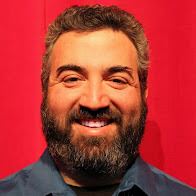 You will see who made the comments in the Google Spreadsheet connected to the form but just leave username unchecked when decided what to include in the Google Doc in DocAppender.